How often do you treat yourself? 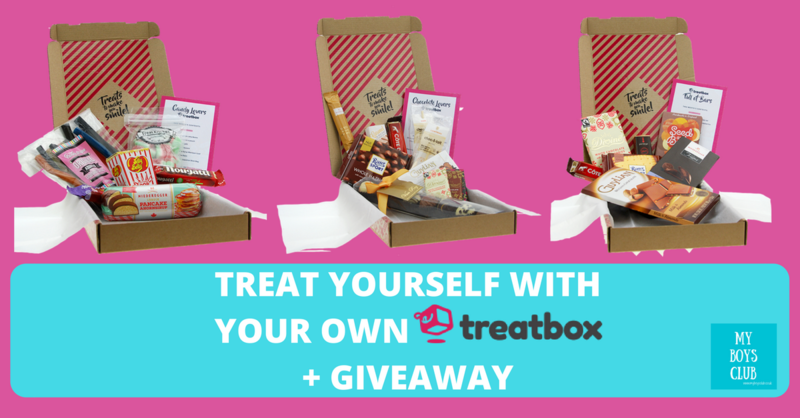 We have teamed up with treatbox to offer you the chance of winning your own little treat. Just for you. The kids get lots of treats. Parents not so many. Sweets, chocolates, fizzy pop, days out, books, magazines, tablet time – the boys are really lucky. I and also feel lucky too that I get to enjoy my boys treats. Well, some of the time – they are not that keen on sharing chocolate – but who is? But allowing yourself extra time to soak in the bath, a luxurious bar of dark chocolate, sometimes just 5 minutes peace and quiet are some of the easy ways to treat yourself and make you smile – who’d have even thought of them as treats pre-kids! However, imagine how would you feel if, through your letterbox, a box of treats arrived just for you? And then every month another one arrived? Simply enter our giveaway via Rafflecopter and you could win your very own Treatbox to sample yourself. Treatbox is a UK based company, Cambridge actually, that discovers and sources the best treats they can find from around the world, then sends them to you once a month (every month) or to someone else as a gift. Whether you are a lover of traditional sweets, quality chocolate, candy, liquorice, full bars of chocolate or Belgian chocolates, there is a treatbox for you. What is inside a treatbox? Treatbox selects from the highest quality sweets and chocolates available to deliver an ideal monthly sweet hamper gift or treat. Each box’s contents depends on what type of box you order. Within the theme of the box you’ll get a wonderful assortment of goodies from around the world, that differs every month. Also, all sweets or chocolates are individually wrapped, so you can easily share the love should you wish! Mine was a Candy Box - Not your run-of-the-mill candy box; this top grade Candy Lovers Treatbox, contained luxury candy and chocolate for the more discerning palette. A delightful mix of firm favourites and new delights for you to discover. Cola bottles are my ultimate favourite sweet - so pleased there was a large packet of those inside! There are though different boxes and you can change the one you receive every month if you like. How often is a treatbox delivered? Every month a treatbox will arrive or you decide to deliver it to a family member, friend or colleague that month as a gift, thank you or celebration – and with a personal message too. To do that you can change the delivery address on your account up to 24 hours before the shipment date (19th of the month). Just remember to change it back! You can also order past month’s boxes, whilst stocks last, as a one-off delivery and these are delivered within 48 hours. Delivery is currently only in the UK and the package should fit through most standard letterboxes, meaning you don’t need to be at home to accept delivery. How much does a Treatbox cost? The monthly subscription cost is £15, charged every month on the anniversary of the day you subscribed, but you can cancel your subscription at any time. You can order your own Treatbox or send one as a gift. And enter the code TREATME at checkout and you’ll receive a 20% discount (£3) on your first subscription order too. The box is simple yet, creative and bright designed perfectly to fit my letterbox and full of great goodies. I love the choice and the branding is so me. A regular subscription, for anything other than a magazine, isn't something that I've taken out before. And I wouldn't usually go and buy myself a bag of sweets or sweet treats, I usually wait until I receive them as a special occasion, but I have got to admit it felt really good to know, even though mine was a complimentary box, that the box of treats, for once, was for me and not the kids. The boys were very bemused by it. And a little envious too! I really like that you can take out a subscription but then change the recipient every month. That's a great idea. It would be a lovely gift to either give or receive and a great selection of goodies to share on a girls night it. Which remind me I must get our next one planned! Disclosure: I received a Treatbox in return for an honest review. 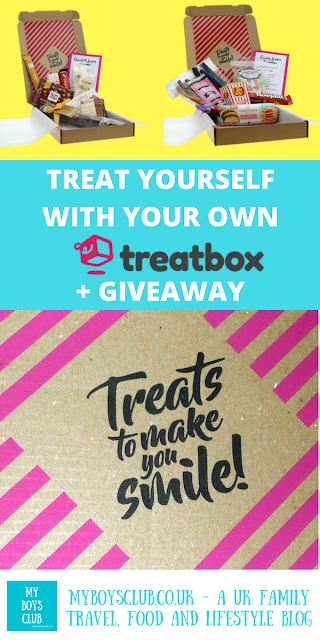 Treatbox are also providing the giveaway prize. This looks great, would be lovely to have a box full of treats! What a great idea. I love the look of these boxes. What a great idea! I'm tempted! Such a fab idea! Yum! how lovely! a treat indeed! These boxes look amazing and it's a good price for a monthly treat. Aw what a lovely treat! Something to look forward to every month! Oh my goodness, any excuse for a treat! Great idea in portioning it out for the month as well! Lovely gift to arrive through the letterbox. Love the look of this treatbox! This is my kind of subscription box: sweets from different countries to indulge my inner geography geek! I love this concept :) I really like the variety of products, and the fact they even offer a facility to build your own! Who doesnt love a little treat every now and again? Lovely, sounds fabulous. I really like how varied the contents are. This is fab! Such a gorgeous box of goodies! These are really good and varied and delicious! I like the look of a different theme each month and also items from around the world to try out.I like the look of this treat box subscription and it would make a great gift. A lovely idea. I had not seen this particular box. What a nice treat to look forward to. I like that it fits though the letterbox. These sound like a great idea, what could be better than a yummy treatbox arriving on your letter box each month. These do indeed look a treat! This looks like a fantastic treat. Something to look forward to each month. Sounds lovely. Will be seriously thinking about subscribing! What a great idea and love the fact that you don't know what you are getting before hand. Like Christmas every month. These are a great idea, thanks for the chance. These look delicious! Thanks for the competition. Good luck everyone! Great idea.A treat for me and a treat for you.